Factors governing increased productivity, more accuracy, greater flexibility of shapes, and reduced manufacturing costs are forcing the manufacturing concerns to use computers in design, manufacturing and other allied functions of industrial activities. With an increase in the need for quality manufacturing along with the factors such as short lead time and short product lives and increasing consumer awareness as regards the quality of the product, it is becoming increasingly important for the manufacturers to initiate steps to achieve all these. The developments in microelectronics in the recent past have made higher computational ability available at a low cost. Therefore, it becomes imperative that manufacturing takes advantage of the availability of low cost and also using yet more powerful computers. Computers have been in use in manufacturing industries since 1960. Initially they were in use only in supportive functions such as inventory control purchase accounting, etc. In to day’s time, computer applications have progressed considerably in all areasof design and manufacturing involving CAD and CAM. Today, computers are not only used in manufacturing but they play also an important role in all manufacturing related activities such as business or financial management, factory level production management, CIM technologies,CAD,feature and solid modelling, and CAM, manufacturing information, manufacturing system. The important sub-activities of industrial environment have been identified to support with the use of computer in the manufacturing industries. 6. Coordinate measuring machine (CMM) Programming. 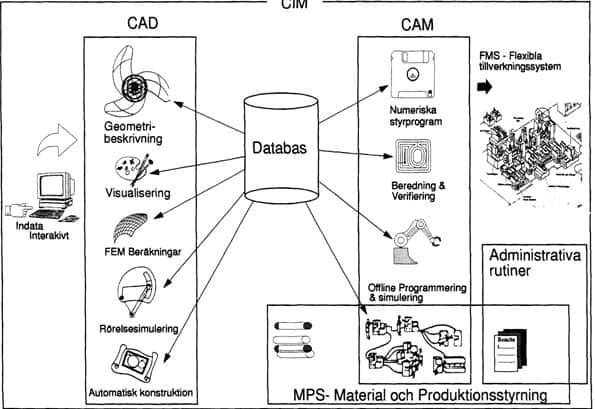 One of the most important components for getting various benefits associated with computer applications in manufacturing is the common databases associated with all aspects of manufacturing. In fact, all the modules in the CAM would actually be sharing the database created in any module. Any module would be able to modify the data as required for that particular application. This approach reduces the work involved in maintaining the product database and at the same time includes the latest modifications for any aspect related to manufacturing. In contrast to the common database approach, it is possible that sometimes individual modules in the production aspects may be taken from different vendors. In this case care need to be taken that information is properly transmitted between the modules and the data updating in all the modules takes place properly and at the right time. Some of above mentioned manufacturing activities are controlled by computers. These activities are commonly identified using the following terms. 9. Computer Aided Material Requirement Planning, etc. 12. Computer aided Testing (CAT).